Chickpeas and Tahini are not just for Hummus bi Tahini you know. 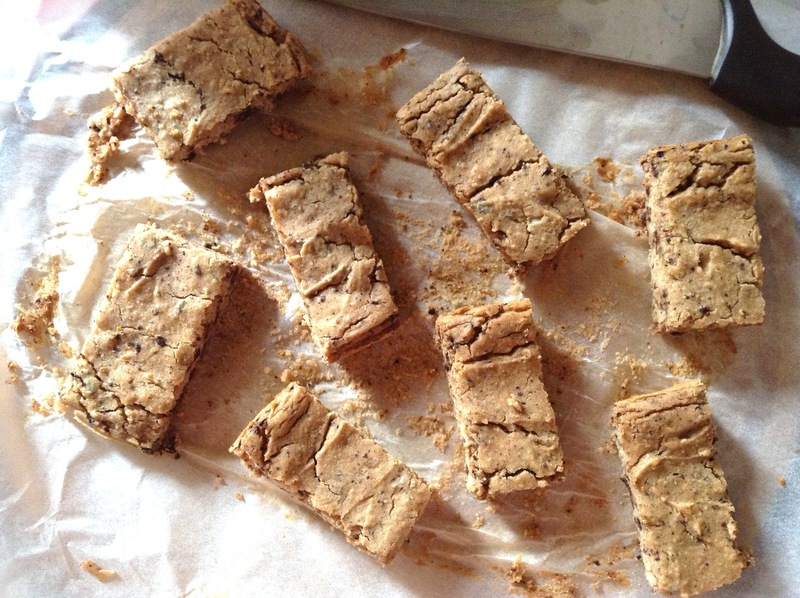 Say hello to these delicious sweet treats, Chewy Chickpea Bars, made from whole cooked chickpeas (not chickpea flour), tahini, almond butter and maple syrup, but there are endless variations on the recipe. These here are made with unsweetened dark chocolate chunks and ground walnuts, but you can also add cocoa powder and turn them into brownies. If chocolate is not your thing, just leave out the chocolate chunks. They are moist, chewy and unbelievably nutritious. They are 100% gluten-free and flourless, refined sugar-free and completely vegan. They are generally macrobiotic friendly, unless you’re on a strict healing diet and your specific condition doesn’t allow some of the ingredients, so if you’re not sure, check with your macrobiotic counselor. The best part of all is that they are really easy to make and no one will never believe they were made with chickpeas and are healthy! Try them out and let me know what you think! Whiz all ingredients together in a food processor until well combined and creamy. The batter should be a bit less dense than a cookie batter, but not runny. Pour batter into a parchment paper lined oven safe dish and bake for about 25-30 minutes on 180 C.
If you’re using canned chickpeas, a 250 g can of chickpeas should do the trick. Just measure out 2 x 250ml measuring cup to be sure. Since I don’t consume sugar at all and only sweeten with malt, fresh fruit and maple syrup, 3 tablespoons of maple syrup is more than enough for my palette. If however you like things on the sweeter side, you can add up to 1/4 cup of maple syrup (an extra tablespoon) but at that point you should hold back on the rice milk by a tablespoon. You can substitute the rice milk with any non-dairy milk such as almond milk or soy milk if you prefer. But I like the lightness of rice milk. Hi Lindsay, great question. I didn’t realize that I hadn’t added it to the directions. I use a rectangular glass dish, it measures 7 x 10 inches. 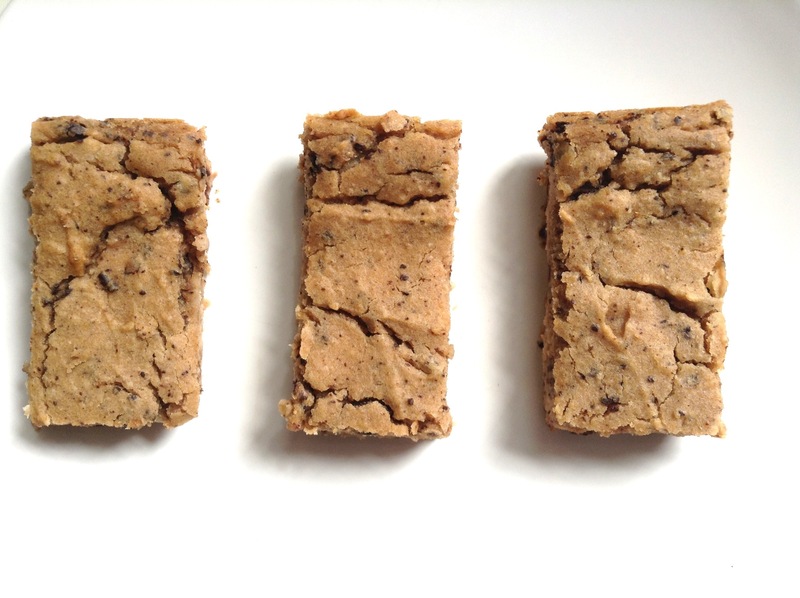 The thickness/height of the batter/chickpea bars is then roughly 1 inch. Enjoy! How would I adjust the baking time to use a 8×8 pan? I’ve never thought of using chickpeas in dessert besides using chickpea flour, but these look great! Yum! I’m so intrigued by this recipe! 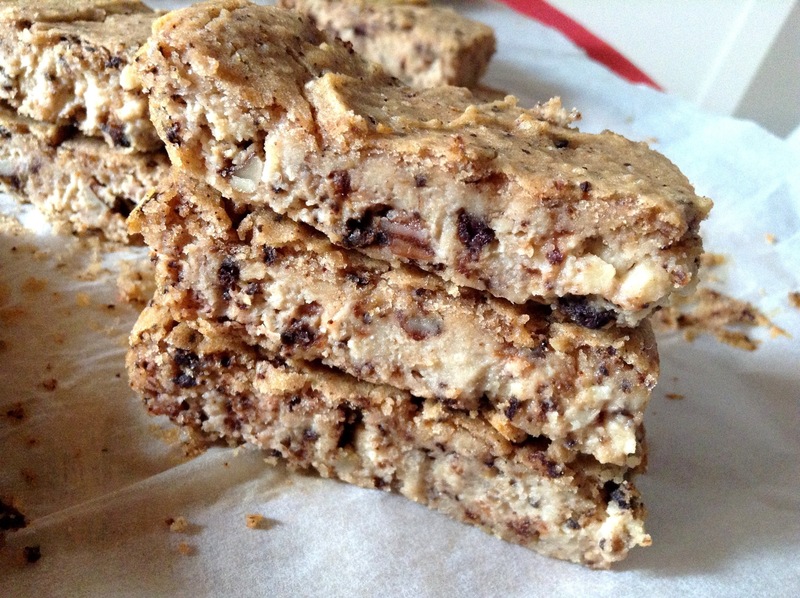 I adore all the ingredients so I’m sure I’d love these bars. This looks delicious Nissrine! Is this recipe low glycemic index too? I have a diabetic friend that’s always looking for good new recipes. Thanks hun! It calls for 3 tablespoons of maple syrup, so I’m not sure wether or not that’s appropriate for a diabetic, but there aren’t any other sweeteners in there. Your friend could try substituting the maple syrup out for a lower GI sweetener that works for him/her. Thanks for the tip Nissrine! I’ve been doing some research. Maple Syrup has a GI of 54. Low GI is considered to be 55 or less, so it’s right at the cut off. I’m still not comfortable making recommendations for someone with Diabetes though, so your friend should judge for themselves based on their condition :-).